No matter how much hype, no matter what your expectations are, when you stand on the edge of the Grand Canyon, it will blow you away. I could stare for hours at all of the layers, colors and intricate details of erosion. The story of the Grand Canyon began its creation millions of years ago. The pieces of the puzzle became exposed as each layer of rock was formed after millions of years of plate tectonics and erosion spread apart the canyon walls. This unique natural wonder developed as the rock layers were revealed. The rough flood waters carried along large boulders and rocks gradually chiseling away pieces of the riverbed as they collide along the rock walls downstream. As the downcutting occurs, the swift current moves quickly along the steep slopes. A large valley was created surrounded by hills and mountains known as the Grand Canyon. The awe-inspiring valley – measures 277 miles long, 18 miles wide, and 1 mile deep – attracts approximately five million visitors annually. Our wonderful park is split into the South Rim and the North Rim. The South Rim is known as the most visited section of the park accounting for over 4 million visitors annually. The South Rim is open year round due to the lower elevation and easy accessibility. The South Rim offers visitors numerous amenities such as: a cafe, hotels, restaurants, bicycle rental shop, visitor center, and bookstore. The Grand Canyon Skywalk at the South Rim offers an excellent opportunity for visitors to view the magnificent attraction from 4,000 feet above the canyon on a horseshoe-shaped, glass-covered patio overlook. With the majority of visitors at the South Rim, the North Rim provides visitors a more quiet and peaceful experience. The north rim sits at 8,000 feet elevation and due to large amounts of snow coverage, the north rim is closed for a few months of the year during snow season. Even though the North Rim is less traveled, there is a lodge and a campsite. Much respect and appreciation to President Benjamin Harrison, President Theodore Roosevelt who had the fore site to preserve our precious land from miners and builders. The Grand Canyon was allocated to be federally protected and enjoyed for public use since 1893. 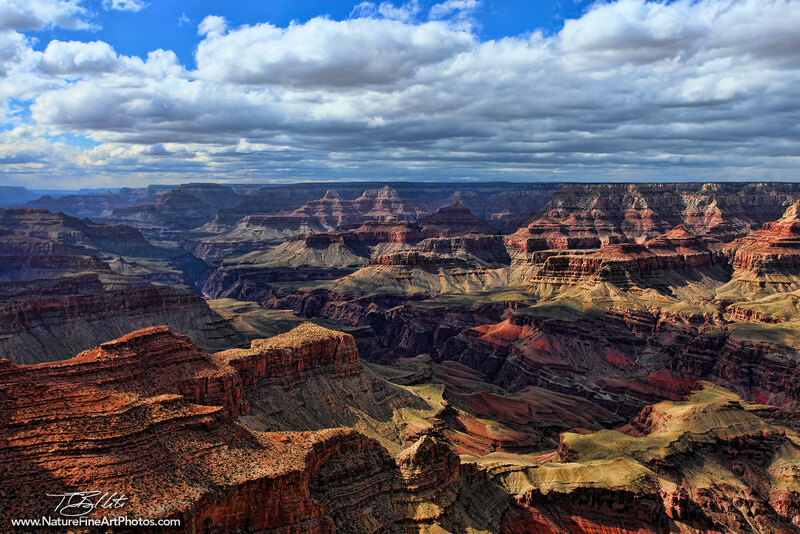 Shortly after, Congress created the Grand Canyon National Park in 1919.